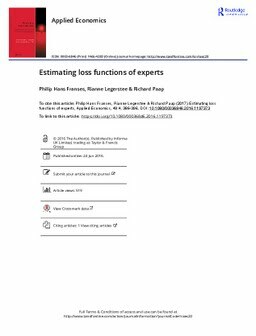 We propose a new and simple methodology to estimate the loss function associated with experts’ forecasts. Under the assumption of conditional normality of the data and the forecast distribution, the asymmetry parameter of the lin–lin and linex loss function can easily be estimated using a linear regression. This regression also provides an estimate for potential systematic bias in the forecasts of the experts. The residuals of the regression are the input for a test for the validity of the normality assumption. We apply our approach to a large data set of SKU-level sales forecasts made by experts, and we compare the outcomes with those for statistical model-based forecasts of the same sales data. We find substantial evidence for asymmetry in the loss functions of the experts, with underprediction penalized more than overprediction.